Presentation on: How much of a historic town can be mapped by a high end terrestrial laser scanner within a working day? Geospatial technology is central to providing a technology platform that forms the backbone of a city - enabling better city governance through greater automation, better asset monitoring, sustainable urban planning and intelligent routing and transportation services. 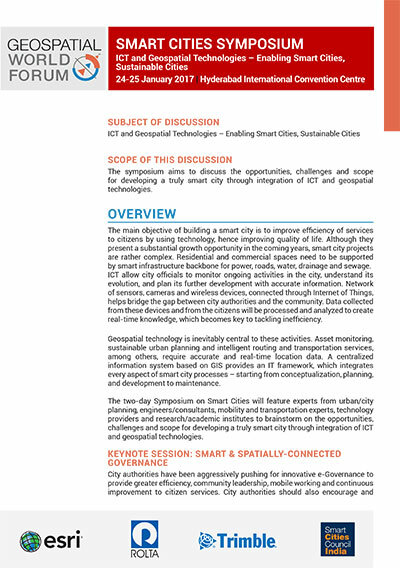 The two-day program on Smart Cities, Sustainable Cities will feature experts from urban/city planning, engineers/consultants, mobility and transportation experts, technology providers and research/academic institutes to brainstorm on the opportunities, challenges and scope for developing a truly smart city through integration of ICT and geospatial technologies. City authorities has been aggressively pushing for innovative e-Governance to provide greater efficiency, community leadership, mobile working and continuous improvement to citizen services. Session will focus on how ICT and geospatial technologies are enabling smart governance, including facility and asset management, urban cleanliness & waste management, environmental monitoring, public works approval, housing and building permits, and others. Conservation and restoration of natural assets, as well as development of green infrastructure assets are critical part in creating a sustainable city. Session will highlight how geospatial technology contributes in sustainable development of cities, with special focus on integration with smart technology like BIM to reduce cost and accelerate delivery time. The entire utility infrastructure asset lifecycle management could benefit from smart technologies, whether in planning, design, build, operate, monitor or maintenance phase. Session shall focus on geospatial in water, electricity (including smart grid) and telecommunication utilities management. Real time geospatial data provides efficient mobility to the citizens through traffic forecasts, best route planning, and public transport updates enabling smart transportation system. Success stories on smart mobility using geospatial technology shall be discussed. Public security is a growing problem for cities worldwide. Integration of geospatial information and smart technologies can support police and emergency responders with new tools to fight crime and make cities safer. Safe city programs, alongside state-of-the-art innovation in enhancing public security will be presented.